This weekend, BBC director general Mark Thompson gave the James Mactaggart Memorial lecture at the Edinburgh International Television Festival, where he discussed the future of the BBC and British television as a whole. He told the audience that broadcasting is a battle today which will require organisations to work together and “break the habit of a lifetime”, while he urged critics not to focus on small matters, such as the governance of the BBC, but the bigger issues. We have, don’t we, a kind of genius in our industry for talking ourselves into a crisis – and then of always being somehow disappointed when the crisis turns out to be imaginary or when the cyclical turns out to be just that – cyclical. Instead, we should concentrate on what matters most and on the issues and actions that could actually make a difference. We should think big, not small. The speech was awarded extensive coverage by the Guardian, from video reactions from audience members to reflective blogs in the aftermath. There is even a short but entertaining post from Channel 4 News presenter Krishnan Guru-Murthy on “how to interview Mark Thompson”, following his post-speech interview with the director. If anyone so much as suspects you are giving him an easy ride you will be despised for it, so you are probably about to overcompensate and be a bit rude for a Saturday-morning chinwag that is, after all, on a subject that can be described as “only telly”. Fortunately, I had no shortage of help in planning the interview. “He can talk for a long time when he’s on stage, so you’ll have to interrupt him,” said one adviser. So I did. Another friend had suggested an interesting tack on executive pay: “Ask him if he is motivated by money? Does it threaten his legacy as DG?” It elicited the only “tumbleweed moment” of the session, as I left his firm rejection of the idea hanging for a moment. Most other news outlets focused on staff and pay cuts announced by Thompson, who said the broadcaster was “committed” to reducing the number of senior managers by at least a fifth by the end of 2011. Criticisms fell on the Times, which was accused by the New Statesman of being biased for having “glanced over” Thompson’s negative comments in relation to Sky, which Thompson claimed is not investing enough in original British content. The News Corp-owned paper reported on Thompson’s speech but somehow glanced over his remarks on Sky and its parent company. Contrast that with the approach of the BBC, which last year reported extensively on James Murdoch’s polemical assault on its “chilling” ambitions. 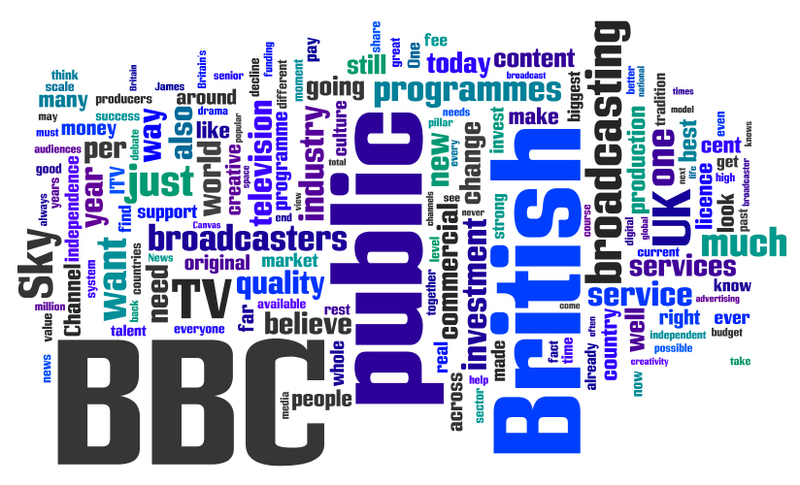 For a more general, illustrative view of the messages behind Thompson’s lecture, Journalism.co.uk has put together a Wordle below of his speech. This entry was posted in Broadcasting, Jobs and tagged BBC, Edinburgh International Television Festival, Mactaggart speech, pay cuts, staff cuts on August 31, 2010 by Rachel Bartlett. Starting this week, the editor’s blog will feature an afternoon roundup of all things media from over the pond. From the hugely important to the very inconsequential, check in for a choice of America’s journalistic goings on. Do you want the bad news or just the news first? Bad? OK. The bad news today comes from the Los Angeles Times in the form of an announcement by ABC that it is to make a “fundamental transformation” to its news division. “Fundamental transformation” being bad-newsspeak, of course, for ‘streamlining’, or ‘workforce optimisation’, or ‘force shaping’, or, even, ‘mass redundancies’. Reports suggest the company may be ‘smart-sizing’ its ‘force’ to the tune of a 20 per cent reduction. The news arm currently employs 1,400 staff. The maths, or ‘math’ in this case, produces bad news whichever way you phrase it. The time has come to anticipate change, rather than respond to it. We have a rare opportunity to get in front of what’s coming, to ensure that ABC News has a sound journalistic and financial footing for many years to come, and to serve our audiences even better. But we must move boldly and promptly. Redundancies have been offered, but it seems likely that if staff don’t move as ‘boldly and promptly’ and Westin intends to, they’ll be pushed. So, listen up: if you can write copy, sub-edit, shoot and edit video, write code, produce an outside broadcast by yourself, mend a broken server, and all the while keep time on the big drum strapped to your back, now is the time to show your face at ABC. Westin’s memo reprinted at the Los Angeles Times. Just in from Editor & Publisher, news that the Washington Post Co. and A.H. Belo Corp (parent company to the Dallas Morning News) both had a profitable fourth quarter 2009. The Washington Post Co. reported a Q4 profit $82.2 million, or $8.71 a share, in comparison with $18.8 million, or $2.01 a share in Q4 2008. A.H. Belo recorded a much more moderate $5.6 million, or $0.27 per share, its first quarterly profit since it was spun off from Belo Corp. two years ago. Newspaper revenue declined four per cent in the fourth quarter to $193.3 million. Print ad revenue was down 9 per cent to $92.6 million, with declines in classified, zones and retail advertising offset by an increase in general advertising. For the full year 2009, the newspaper division reported an operating loss of $163.5 million, compared to an operating loss of $192.7 million in 2008. Advertising revenue continued to fall substantially in the quarter, with the retail down 30.9 per cent, and print classified down 31.1 per cent. Internet revenue fell 8.5 per cent, to $10.1, which accounted for 7.5 per cent, of total revenue for the quarter. From E&P again, news that Erik Wemple is leaving the Washington City Paper, where he has been editor for eight years. He will join Allbritton Communications’ new local start-up in Washington D.C.
Wemple accepted a position as editor of Village Voice in New York during his editorship of the Washington City Paper, but changed his mind before his first day, deciding instead to stay put. Today’s big social media news is a Yahoo/Twitter partnership. Yahoo and Twitter have reached an agreement to share data between their properties. That’s great. Yahoo is only a few months behind Google and Microsoft (Bing) doing the same thing. It seems Yahoo! got so over excited at the news themselves that they toyed with their Twitter followers over the course of the day, hyping the announcement by tweeting clues, and possibly confusing its importance with your Moon landings and presidential race winners. Mashable goes into more detail about the partnership, claiming that despite its tardyness it is more comprehensive, and a better all round deal than Twitter’s search partnerships with Google and Bing. There is a difference between the terms “local”, “hyperlocal” and “niche” and I want to outline our editorial policy regarding the three. We see the three used interchangeably some times, and I think it’s important we all recognise the differences. ‘Hyperlocal’ covers neighborhoods, while ‘local’ covers towns and cities. We get some press releases here about how stations or newspapers are starting new ‘hyperlocal’ websites that cover their city or a given topic in their city (say, ‘moms’). A mum blog is a niche site. A neighbourhood blog is hyperlocal. A city blog is local. Disagree? Let us know. This entry was posted in Journalism, Journalism Daily, Online Journalism and tagged ABC, Hyperlocal, staff cuts, Twitter, US Digest, washington city paper, Washington Post, Yahoo on February 24, 2010 by Joel Gunter.